UVA's first FM radio station, WTJU, was founded in 1957 and celebrated its 60th anniversary this year. Take a look back at six decades of FM radio at UVA. In May 1957, a handful of students gathered in a first-floor studio in Old Cabell Hall for the first broadcast on 91.3 FM. In just a few short minutes, classical music filled the airwaves, radiating out to a small audience in Charlottesville that would grow into a dedicated following. The University of Virginia had made it to FM radio. The station – named WTJU, for “Thomas Jefferson’s University” – was UVA’s first FM station and just the second in Charlottesville, where most cars still had only AM radios. Today, as the entire University celebrates its bicentennial, WTJU is celebrating its 60th anniversary and looking back on its beginnings in Old Cabell Hall. 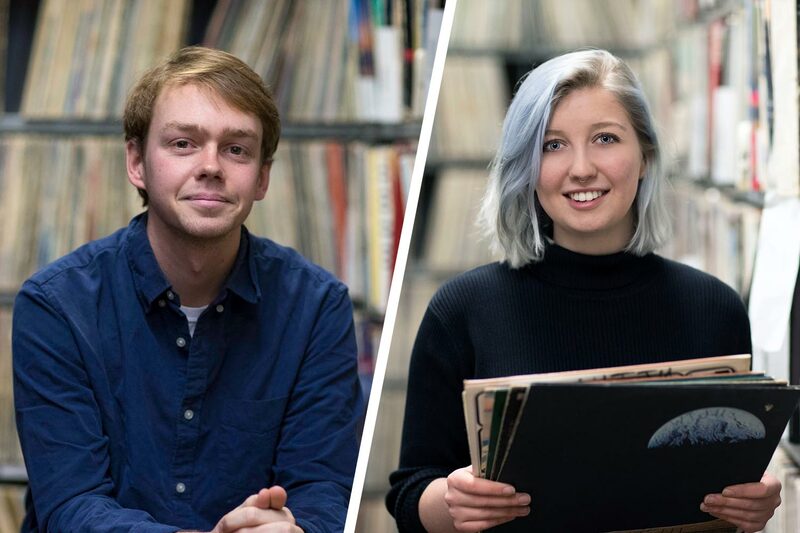 “WTJU started as a non-commercial broadcasting outlet, run almost entirely by students and broadcasting mostly classical music,” current station manager Nathan Moore said. Though WTJU’s first FM signal was weak – Moore said it would have been hard to pick up even in downtown Charlottesville – the roughly 20 UVA students on that inaugural staff had big ambitions for their slice of the airwaves. They interspersed classical music with interviews with professors and news broadcasts shared from WUVA, the closed-circuit AM station based at the University. Early records reveal programs like “The World’s Great Literature,” where prose and poetry was read aloud; or a “Today’s Lecture” series sharing recorded lectures from the University’s classrooms. One of WTJU’s most popular programs was an annual exam marathon, which provided a classical soundtrack for long hours of studying. The station broadcast from 6 p.m. to 11:30 p.m. on weekday nights through a 10-watt transmitter located in the attic of Old Cabell Hall and connected to a stub antenna on the roof. 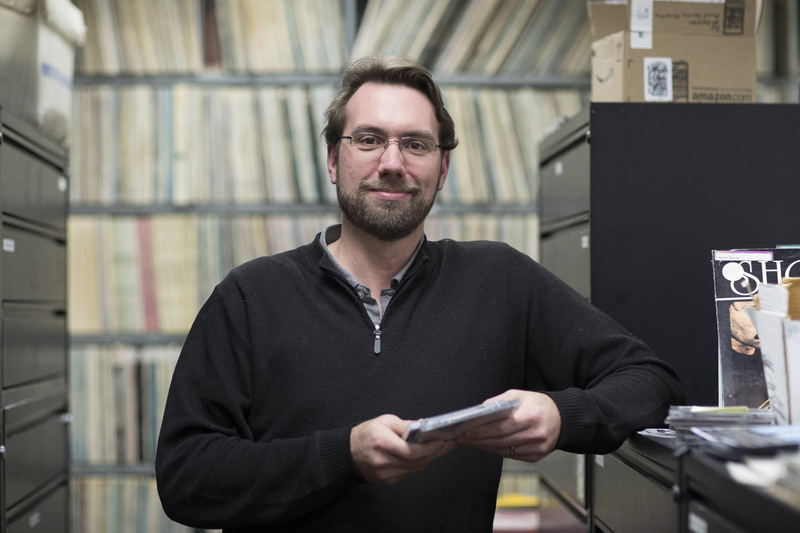 Rod Collins, the graduate student who led WTJU with the support from the then-Department of Speech and Drama acquired most of the station’s records himself, either by requesting donations from record companies or purchasing albums on his own. “Rod was a genius at getting records,” alumnus Rey Barry said in an interview this summer with WTJU. 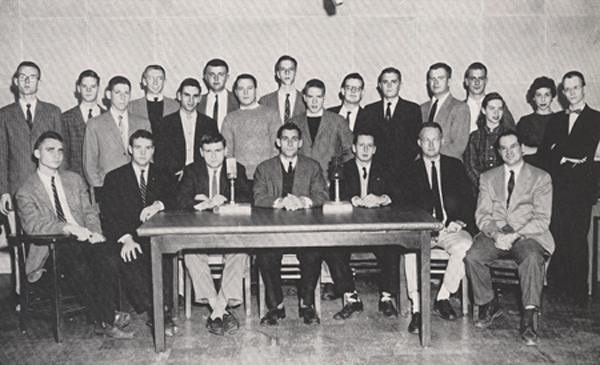 Barry, who went on to a career in radio and newspaper reporting and still lives in Charlottesville, was among the student announcers who helped establish and lead WTJU in 1957. He first adopted “Rey Barry” as a stage name on air – his legal name is Barry Plotnick – but he continued to use it in both his professional and personal life. Barry often worked the late shift, playing classical records that Collins had selected and sharing the jacket material that provided context for each piece. As the station’s audience continued to grow, the station’s playlists – and the styles of music it broadcast – continued to broaden. By 1960, WTJU had moved from Old Cabell to the basement of the Humphreys dormitory, and student DJs were exploring their interests in genres like rock, jazz and folk, as well as classical. “The station attracted people who had a deep interest in and knowledge of some area and wanted to share it,” Berry said. By 1970, as women were being fully admitted to the University, the broadcasting schedule increased to 12 to 18 hours on weekdays, and rock, jazz and folk played a prominent role in WTJU’s programming – a role that has never diminished. “Even now, 47 years later, those are the genres that we have at the core of our programming schedule,” Moore said. Marcia Doran, who joined the station as a first-year student in 1974, was among the first women on WTJU’s staff. She oversaw its rock music programming and became the first female program director overseeing the station’s operations. She recalled being on the air at seminal moments in history, such as the assassination of John Lennon in 1980. “We went on the air, played Beatles music and fielded phone calls from heartbroken people,” Doran said. 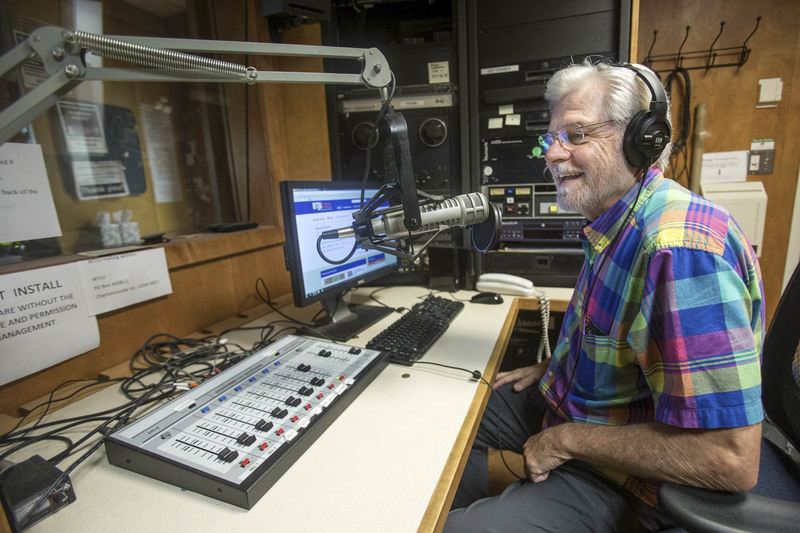 It is that combination of music discovery and local community-building that makes WTJU so important to its staff, its listeners and the University, said Doran, who has remained very involved with the station and currently serves on its advisory board. WTJU continued to evolve in the decades after Doran’s time as a student, expanding to a 24/7 broadcast schedule, adding more community DJs to work alongside students, switching its radio frequency from 91.3 to 91.1 FM, and eventually moving to its current studios in Lambeth Commons. The station also brought in professional managers like Moore to help students coordinate with the FCC and to recruit and direct community DJs. In 2013, Moore launched a second, entirely student-run affiliate station, WXTJ, to provide even more opportunities for student DJs and give students more leadership opportunities. WXTJ airs 18 hours per day online and on 100.1 FM. Both stations are non-commercial, funded by a combination of private donations, grants and University support. Currently, WTJU and WXTJ have some 300 volunteer student and community radio hosts who play more than 1,100 unique songs per week – far more than the 100 songs played on the average commercial Top 40 station. WTJU, which reaches more than 13,000 listeners per week as far away as Staunton and Culpeper, also hosts numerous music and educational events for the UVA and Charlottesville communities. These include live in-studio concerts, film screenings, youth radio camps and a free outdoor concert series at Charlottesville’s IX Art Park. The DJs themselves are as eclectic as the music they play, including numerous community DJs who work alongside students. Retired middle school principal and UVA alumnus Dave Rogers, known on-air as “Professor Bebop,” has broadcast every week for 45 years, using his signature jive-talking style to share two hours of rhythm and blues. Moore also brings in guest DJs to share new music and learn more about how other cities and countries utilize community radio. 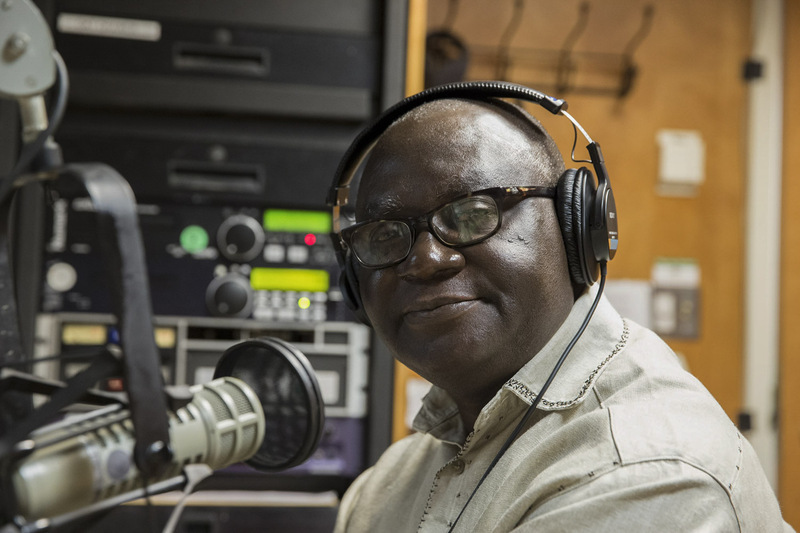 In September, WTJU welcomed Kwesi Ghartey-Tagoe to share stories from his own community station, Radio Peace in Charlottesville’s sister city of Winneba, Ghana. “I wanted our volunteers and UVA students to hear about that firsthand,” Moore said. And of course, there are the student DJs. The current generation of student hosts is just as energetic and committed as the original group in 1957, and they say they love the community that the station creates just as much as they admire the music it shares. Fellow co-director Kirsten Hemrich, a studio art and poetry student, said she thrives off the creativity of her fellow student DJs. In addition to working in the studio, Hemrich often plans concerts and community events for WXTJ, pulling in both student and local artists. The station helps students gain on-the-ground experience that will be an asset in any job they pursue. Browning and Hemrich work together to make WXTJ’s production schedule each week, recruit and select new student DJs and make sure everyone is on task – all in addition to running their own radio shows. That on-the-job experience, Moore said, is a key component of what makes college radio so vital. Many of the station’s alumni have gone on to careers in broadcasting, entertainment or media, and many more have used their public speaking and management skills in a wide variety of industries. Taken together, the two stations provide the soundtrack for the University community, from the classical music that enlivened study sessions in 1958 all the way through jazz, rock ’n’ roll, hip-hop and whatever comes over the airways next.